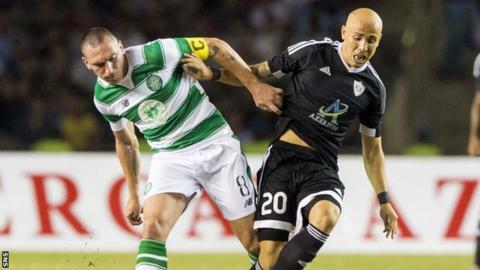 Tension stalked Celtic's every move in Azerbaijan. From concerns about the heat and state of the pitch to the composure and confidence of the Qarabag players on the ball, the assignment had the potential to be perilously fraught. It is a measure of the growth of Ronny Deila's team that they managed the challenge almost flawlessly. On one occasion in the first half in Baku, Craig Gordon had to show again that he has the agility and instincts to produce stunningly impactful saves, and two breakaways late in the game should have been ruthlessly converted by Stefan Johansen and James Forrest. The overall sense, though, was of a mature, resounding performance built on the soundness of Celtic's defence and the ferocious work rate of the players. Celtic have travelled a significant distance in 12 months. Uncertainty was the predominant mood in the Champions League qualifiers last season, but the team is now assured, organised, convincing and, most pertinently, mentally tough. A one-goal lead from the first-leg was a precious but fragile cargo to carry into Azerbaijan, but Deila's side never looked like surrendering it. The display was most effective when understood as a team effort. Cover was provided - Deila was often heard on the touchline in the first-half urging Emilio Izaguirre to sit deeper and provide defensive security at left-back - and the midfielders were particularly diligent. It has become commonplace to recognise the industry and edge of Scott Brown's presence in the centre of the pitch but Johansen continues to set the tempo of the side, combining a sure touch with bottomless reserves of stamina, and Nir Biton is growing in stature and influence. Brown and Johansen hared around the pitch, and the former was particularly exuberant in his celebrations after the final whistle, yet Biton's calmness and authority were just as vital. The same air was exuded by the two centre-backs, with increasing signs that Dedryck Boyata and Virgil van Dijk can develop an effective partnership. It was telling that Deila made a point of mentioning the team's back-to-back clean sheets afterwards, since Celtic's lapses into spells of insecurity in Europe last season seemed to spread through the entire side at times. The two centre-backs are still young, but Van Dijk has been exposed to this level of competition before and been shaped by those experiences. Reaching the group stages would have a personal impact, since it is likely to mean that he will remain at the club at least until January - although he remains on a list of centre-back options that Southampton are monitoring. The defensive reliability is critical to Celtic, because the players now have first-hand reassurance that a narrow lead can be effective enough. The play-off stage is not as daunting as it might have been, since Celtic are seeded in the champions' half of Friday's draw. Maccabi Tel Aviv, Partizan Belgrade and Malmo all have past European pedigrees, while Skenderbeu Korce of Abania and Astana of Kazakhstan are less established at this level. Nonetheless, Celtic need not be alarmed by whichever challenge the draw delivers, and Deila was shrewd in his insistence late on Wednesday night that Qarabag would be more difficult opponents than any they might face in the play-off. The message he was sending to his players was that they can be sure of themselves at this stage of the competition because they have already proved their capabilities. Some supporters might grumble that the team lacks attacking flair on European nights, but that is more of a reflection on the drop in standard of opponents when Celtic play domestically. The side can be freer and more expressive in the Scottish game, but European competition exerts different demands. Nadir Ciftci has started all four of Celtic's Champions League games this season, despite the fact that Leigh Griffiths has already broken his duck for this campaign and is a more reliable finisher with greater predatory instincts. Ciftci is more robust, and more inclined to carry out some of his work away from the penalty area, but Celtic need to prioritise discipline and conservatism over attacking intent in European games. The onus is on creating clear cut scoring opportunities and having the cold, clinical instincts to convert them. Johansen, Stuart Armstrong and Gary Mackay-Steven are restrained by necessity in European ties, but they still need to balance that with the shrewdness to know when and how to commit to attacking opportunities. That understanding comes with experience. Overall, though, Celtic are better able and more capable of progressing in the Champions League than 12 months ago. The play-off round will be testing, whatever the draw, but Deila's side can approach the two games with a sense of assurance. In Gordon, Lustig, Van Dijk, Brown, Biton and Johansen they have players who have learned and improved from previous experiences in the competition, and they are part of a team that has the fitness, energy and determined ambition to succeed at this level of the competition.